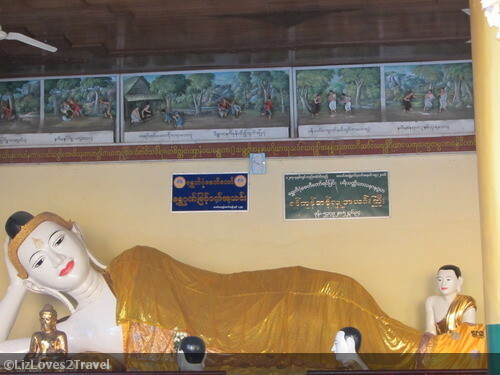 I don't have a very detailed plan on how I'll spend my first day in Myanmar. So I just grabbed a map from the reception and went out. 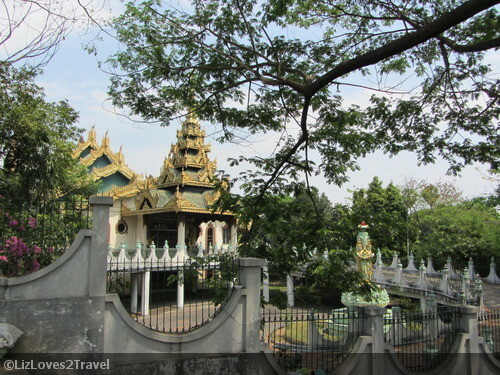 Botataung Paya seemed near Motherland Inn 2 based on the map. But after a few minutes under the sun, I gave up on finding it. The street lay out of Yangon was very confusing to me. 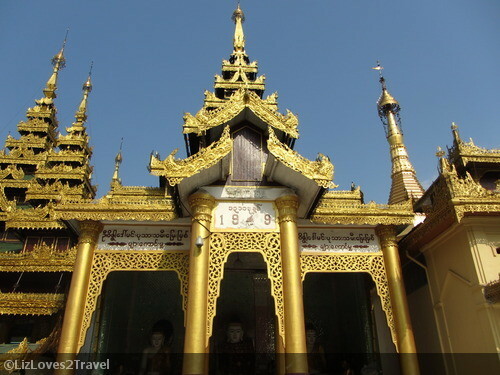 I just hailed a cab and decided to see the oldest historical pagoda in the world. 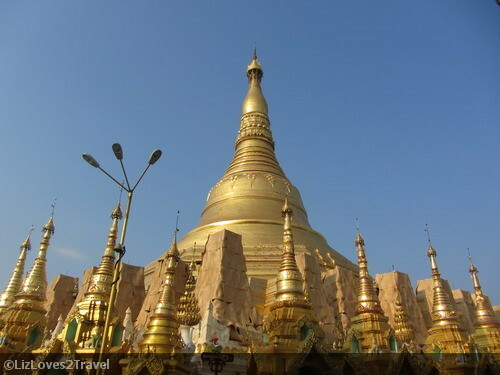 Paya is the Burmese word for stupa or pagoda. It can also mean "God". I might use this word more often in this series as I got used to saying it instead of pagoda. The taxi dropped me off at the South Gate of the Shwedagon Paya. 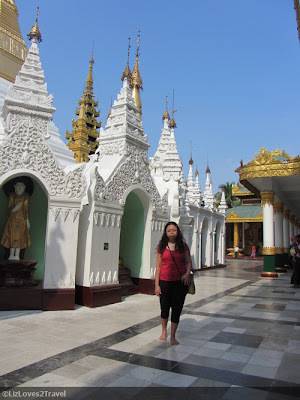 A nice temple across the road caught my eye so I went there first before proceeding to Shwedagon. 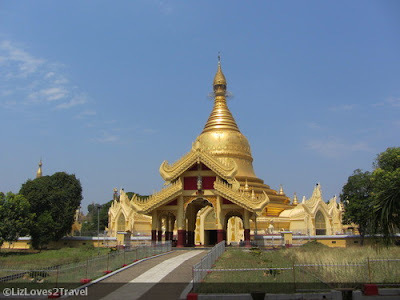 This pagoda was built in 1980. The relics enshrined here were given by the King of Nepal. It is well-proportioned and the design is both of traditional and modern styles. It was built as a memorial to the First Congregation of Sangha of All Orders. I'm not expounding that anymore hehe. This temple is just small but lovely. It was my first Myanmar pagoda, so it was where I first observed how they do worship and how I should I behave inside a paya. No visit to Myanmar is complete if you did not see this enormous charmer. Shwedagon Paya or Pagoda is considered as one of the religious world wonders. 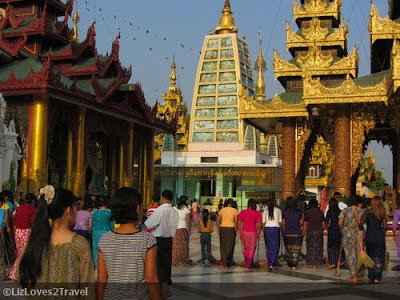 It is the most sacred Buddhist pagoda for the people of Myanmar. 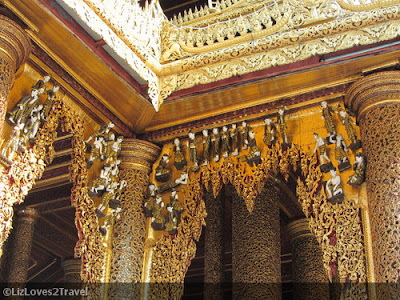 It was built 2,600 years ago containing the relics of four Buddhas. The bell-shaped structure is 326 feet in length. The complex structure is made of genuine gold plates. The people of Myanmar including the royalty from the past are donating gold to maintain it and it still happens until now. For the upper dome, it is studded with 5,000 diamonds and other gems. At the very top of that, is a 76 carat diamond. How grand is that? The pagoda is surrounded with a big open terrace. 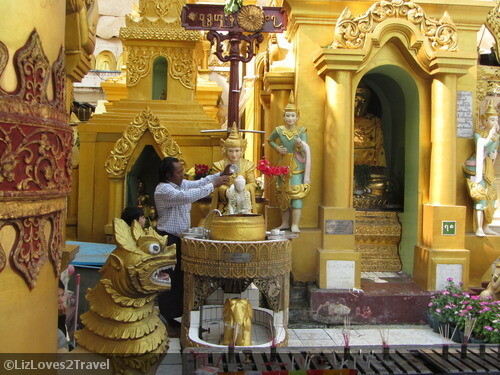 There you'll find many colorful shrines, pavilions, stupas, Buddha images, and other objects of worship. The pilgrims walk clockwise around the main Pagoda, before stopping in one of the pavilions to pray, meditate or contemplate. That's how they do it traditionally until now. 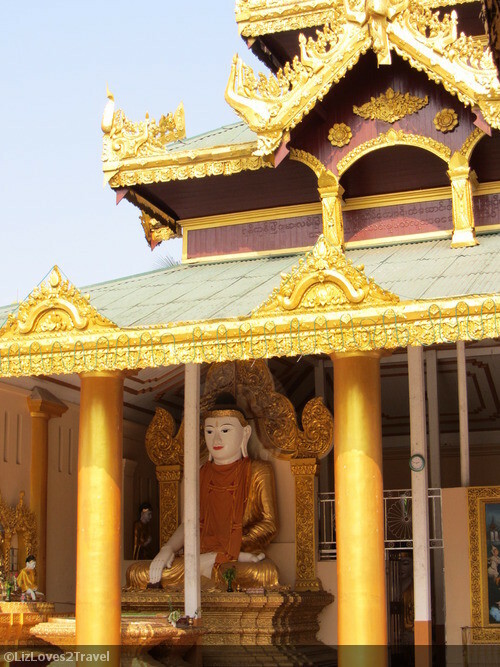 There are four entrances leading up to the paya. The foreign visitors are required to enter from the North Gate because there is a lift that may take them straight to the terrace. But I didn't mind using the South Gate. From there, I was also able to see the Maha Wizaya. 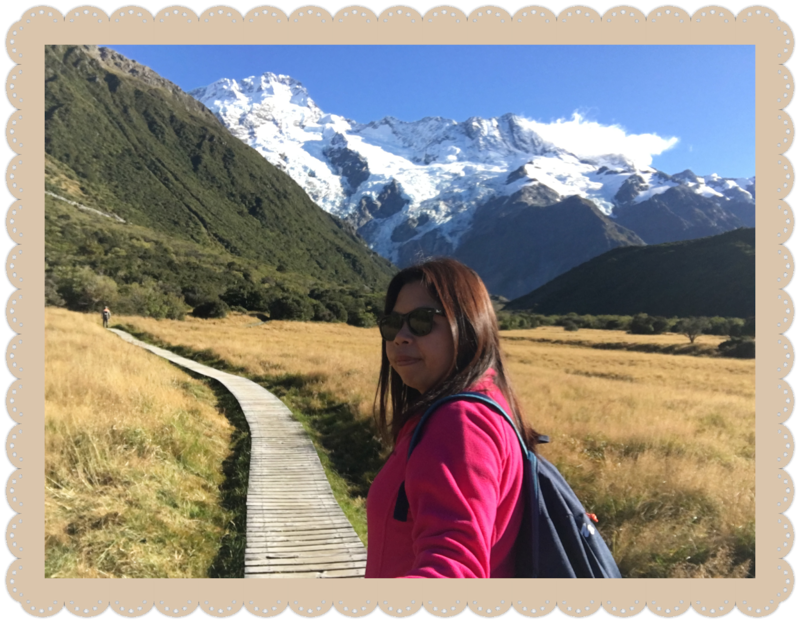 I love to do it the long way just like the locals do. No wonder when I presented myself at the Entrance Booth for Foreigners to pay, nobody was coming to get my payment. I just found out later on that I entered the gate where locals normally do and probably also because I didn't look like a tourist. Entrance Fee is USD 5.00. Everything about it is mind-blowing. The architectural details of all structures in the entire complex are magnificent. Another thing that you will notice as you walk around the terrace are these Buddha posts where people offer flowers and prayer flags, and pouring water to the Buddha along with a prayer and a wish. 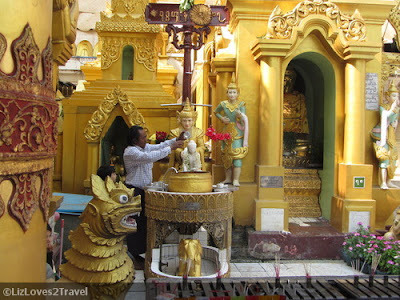 This has something to do with the Myanmar Buddhist's belief in Hindu Brahmanism astrology. It is imperative for them to know the day that they were born so they can practice this devotional act. Each planetary posts signifies each days in a week. Visiting pagodas are very important to the Myanmar Buddhist. You will also notice that they always bring something to offer to Buddha. The act of giving is a huge part of Buddhist teaching. Anything you do with generosity, love, kindness and compassion is a good karmic deed. 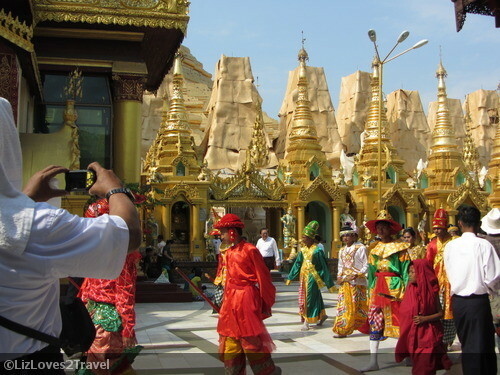 Just thirty minutes after I made it to the paya, I witnessed one of Myanmar's celebrated festivities. They call it Shinbyu. This only happens during school holidays (March) and before the water festival or the New Year (April). These rites last for 2 days. 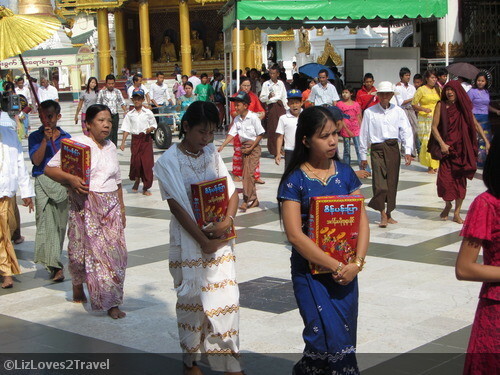 It happened to be the first day of Myanmar school holiday when I arrived. 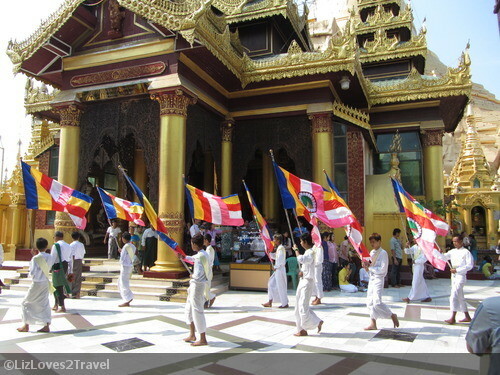 The Novitiation Ceremony involves a parade around the pagoda with the boys dressed up as princes. 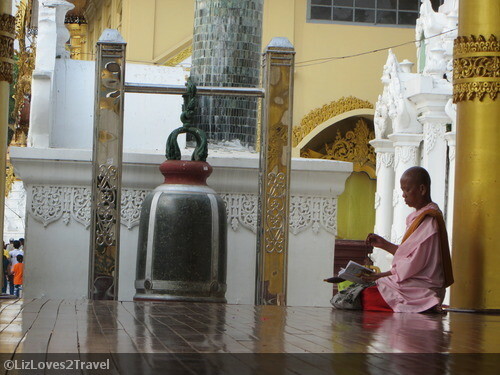 In Theravada Buddhism, this marks the ordination of a boy under the age of 20 as a novice monk. In their tradition, the parents' most important duty to their son is to let him go forth and embrace Buddha's legacy by letting him join the Sangha (Buddhist Monastery) as a novice. The boys will be immersed in the teachings of Buddha. They have an option to live in the monastery for a while or for the rest of their lives if they choose that path. 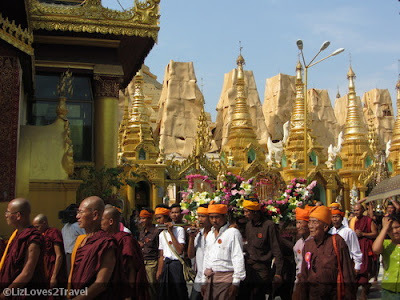 This ritual symbolizes Prince Siddharta Gautama aka Buddha's departure from the luxuries of the royal palace and leaving his family in search of the Four Noble Truths. The little boy dressed as a royal king or prince is shielded from the sun with a golden parasol and is being carried as on horseback. Behind what seemed to be his horse is the family, his parents carrying his monastic robes and eight other requirements. After them are his sisters or village maidens wearing their best silks, carrying ceremonial boxes of "paan" and lotus blossoms. The rest are the completing party of the joyous procession. I consider myself lucky that day. It was amazing to witness this kind of traditional rite. It is a window to the Myanmar Buddhist culture. 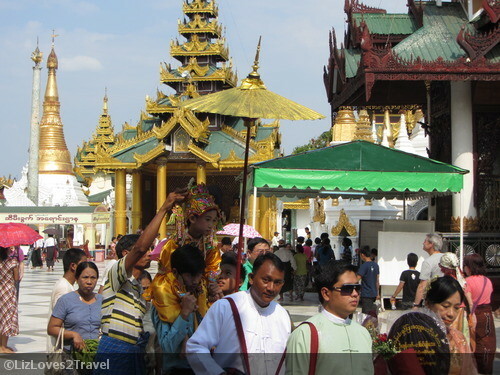 It is one of the things I look forward to when I travel, learning more about the country's culture and tradition. I stayed and walked some more to observe just about everything around me. 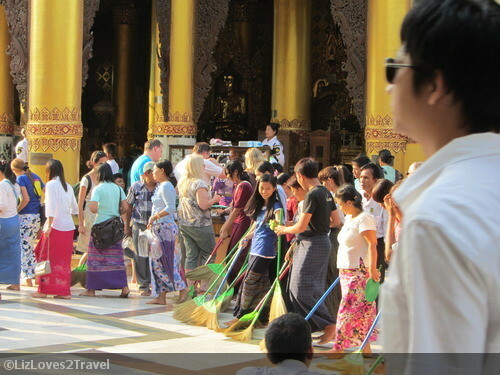 If you ever wonder what those women in horizontal line were doing, they were sweeping the floor! Yes. 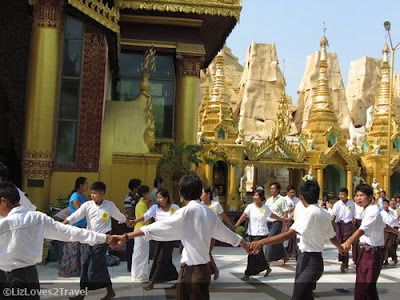 They form a long parallel line covering the entire area of the terrace and they sweep altogether all around the pagoda. I've only seen something like that in Myanmar. When I first saw the men carrying a cart full of brooms, I thought they were like selling it. I was surprised to see after a few minutes that, this was its purpose. They do not employ people to do the cleaning job. The community is just working altogether to maintain and keep the shrine clean at all times. 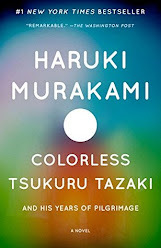 That was fascinating. You will also see these traditional jars which contain water for public consumption. You will see these as well in the streets, public markets or any other places in Yangon. 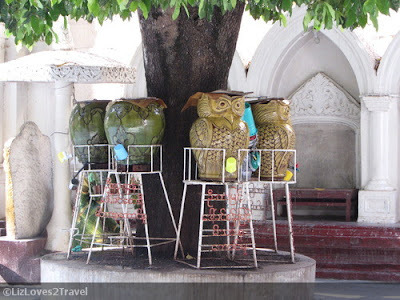 For travelers, maybe it's best to stick to their bottles of mineral water just to be safe. 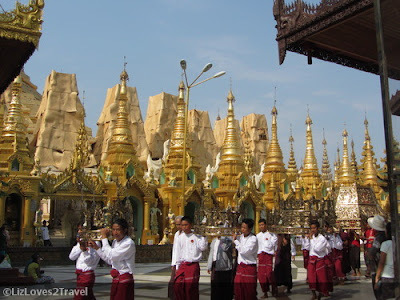 This is Part 1 of my Myanmar travel series.